Steve’s outgoing personality and talent for acting make Aktion Club the perfect organization to get involved with. Steve is an ambassador for Aktion Club and helps new actors integrate into the group. 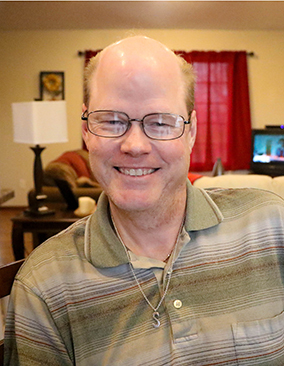 In addition to Aktion Club, Steve enjoys staying busy by bowling, playing bingo on the weekend with friends and volunteering in the community. Steve also works on a MRCI Crew at GC Distributing he works on bagging gloves. Steve’s ideal job would be working at a retail store and bringing carts inside. When Steve is at home he enjoys watching football and making his favorite meal—Taco Ring. Someday Steve would like to travel to New York City to see the sights and see a Broadway play.